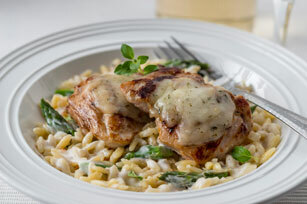 Pan-seared chicken thighs served with creamy orzo pasta, asparagus and herb & garlic cheese. Heat 2 Tbsp. dressing in large skillet on medium heat. Add chicken; turn to evenly coat with dressing. Cook 12 min., turning after 6 min. Meanwhile, heat remaining dressing in medium skillet. Add onions and garlic; cook and stir 5 min. or until onions are crisp-tender. Stir in broth; bring to boil. Add orzo; stir. Simmer covered on medium-low heat 7 min. Add asparagus; cook on medium heat 3 to 4 min. or until broth is absorbed and asparagus is crisp-tender. Add 1/2 cup cheese; cook and stir until melted. Top chicken with remaining cheese; cover. Cook 3 min. or until chicken is done (170ºF) and cheese is melted. Serve over orzo mixture. If you have leftover cooked chicken, you can substitute that for the uncooked chicken. Just prepare recipe as directed, omitting the 2 Tbsp. dressing used to cook the chicken and increasing the final cooking time until chicken is heated through.